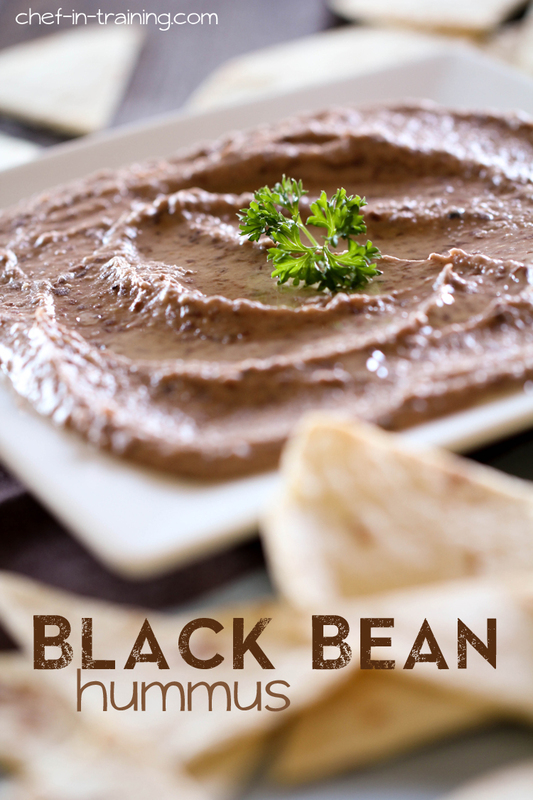 Let me introduce you to Black Bean Hummus… this could quite possibly be my favorite hummus yet! It is jam packed with INCREDIBLE flavor that will have you coming back for more. If making for a large crowd, you may want to triple this recipe. A single recipe will serve 2-3 people comfortably. I will definitely be making this recipe again and again! This could possible be the best hummus recipe ever! It is SO good and jam-packed with flavor! Combine black beans, olive oil, lemon juice, white wine vinegar, salt, cumin, onion powder, chili powder and minced garlic into a blender. Blend until smooth. Spread into a flat dish, creating grooves on the top with spoon. Let rest about 10 minutes then drizzle some olive oil into groves. Evenly distribute tortilla wedges onto a lightly greased cookie sheet. Lightly spray tops of tortilla wedges with cooking spray. Bake at 350 for about 7-10 minutes or until crispy and slightly golden in color. This sounds yummy, I love black beans! OH MY!!! I love black beans and I love hummus! I can't wait to get this into my mouth! Oh such a fun twist on hummus ! Will have to keep this in the to do pile! This was in my inbox this morning. I made at lunch. DELISH!!!!!! Sounds great, I'll be trying it soon! I just made your black bean hummus. Never would have thought of it myself! Thank you, it tastes amazing! love, love! my hubs and i have spent a small fortune on hummus from the market and i finally decided to try a black bean hummus recipe....amazing! So inexpensive and I almost always have every one of those ingredients on hand. My hubs loved it and that can't be all bad! Delish! I make my own black beans and never thought to do this! Wow it cameout so awesome! Thank you for sharing!!! I made this and ate it all in two days...by myself. It was that amazing!! I just bought another can of black beans so I can make it again. New favorite!! Thank you for this! I have made this several times and EVERYONE who has tried it loved it, even those who don't normally like hummus! I made this for my family get together this weekend for the Fourth of July and it was delicious! A big hit. Thanks for the recipe! Hummus is not hummus if it doesn't have the tahini; what you've created is a version of a black bean dip. can I sub any kind of vinegar for white wine vinegar? I made this for our family wedding reception and it was the star appetizer!! I had to share the recipe with several people and it is now a staple in our home. Delicious and healthy!! A nice hummus with a bit of a more tart flavor rather than spicy. Hate chick peas. This was delicious. Added a couple tablespoons of pickled jalapeños into he blender with everything.